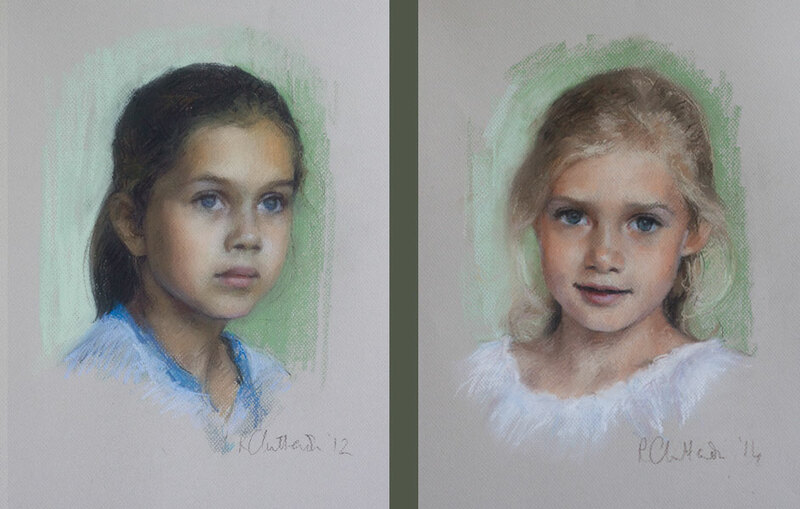 I had painted Florence’s sister, Isla, a couple of years ago when she was 10. Isla, see below, was a beautiful, relatively shy, dreamy, bookworm brunette. The pose we chose then reflected that and had a gentle serenity about it as she gazed out of the picture. Two years later, in bounced Florence. Completely different. Blonde, lively, slightly tomboyish and rather ‘bonkers’. Every bit as beautiful as her older sister, and the most incredible huge blue eyes. Florence was very easy to photograph as she was not remotely shy. But the problem here lay in capturing her extraordinary beauty without it becoming twee or chocolate-boxy. I needed to convey her sparkly energy. Important not to be too ‘perfect’ or smooth. The key lay in a slightly unruly, un-contained hair-style that reflect her irrepressible nature, and plenty of vibrant, energetic pastel strokes. 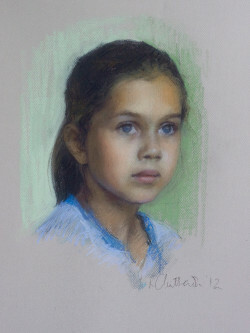 I feel that the result is a strong portrait that is quite hard to look away from. She fixes you with her huge blue eyes and challenges you.